Our first view of Huis Ten Bosch from the train station. 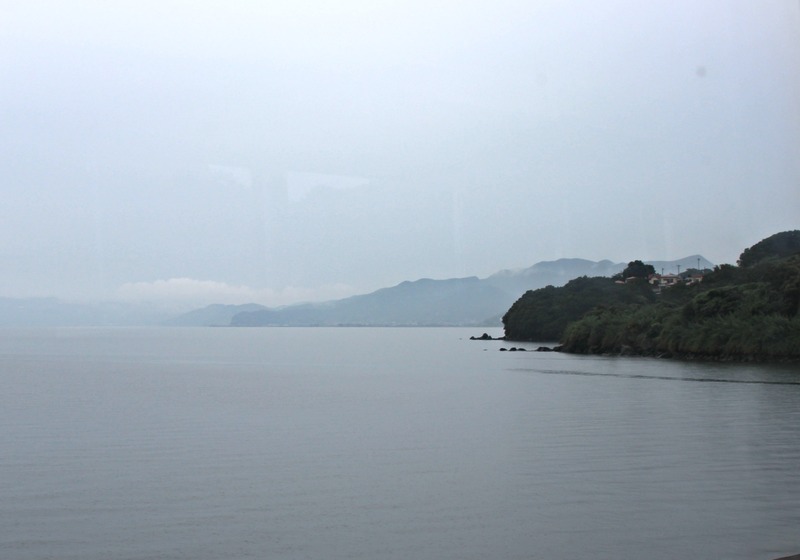 On a drizzly afternoon in October, M and I jumped on the JR Seaside Liner train at Nagasaki Station. Our destination? 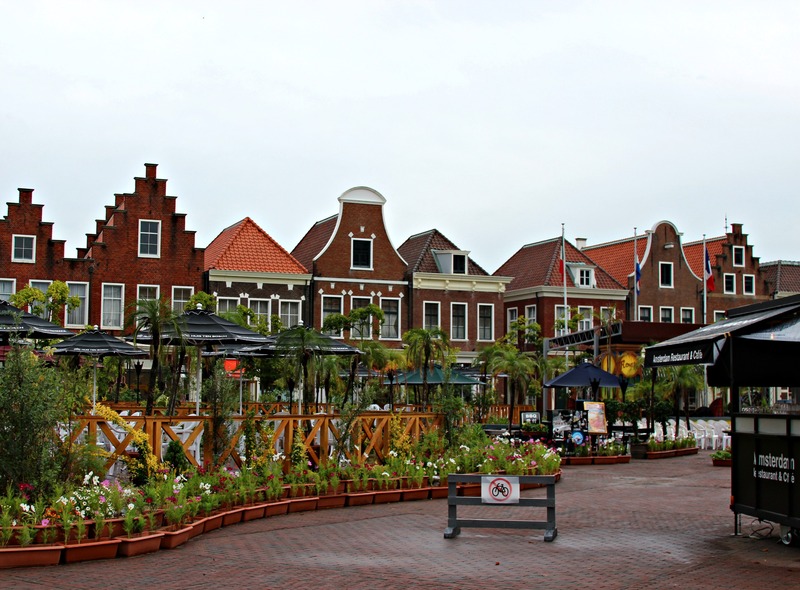 The 152 hectare theme park resort known as Huis Ten Bosch! 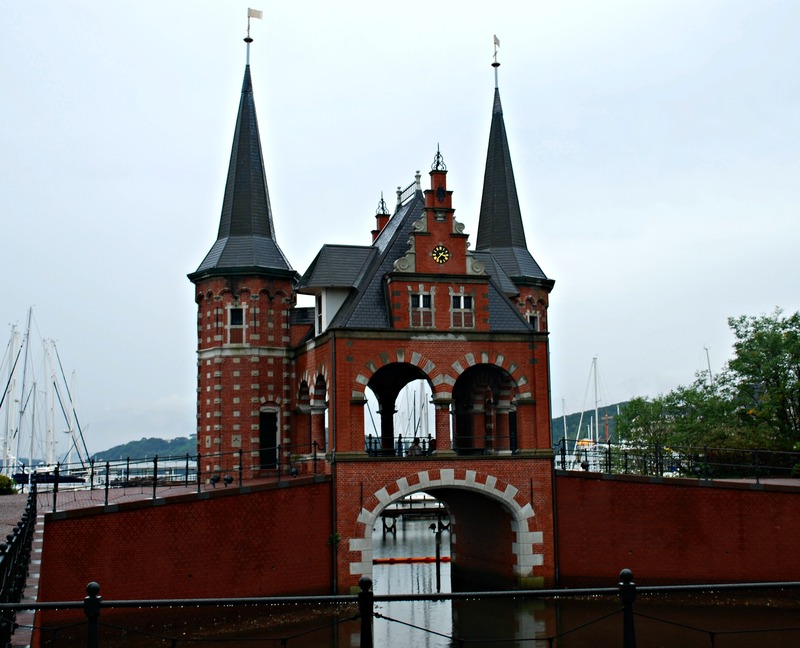 Modeled on a medieval 17th century Dutch town, the park features canals, windmills, rides, forests, a marina, restaurants, and lavish hotels ~ all of which supposedly cost a whopping $2 billion US to build. As the train rumbled along, we settled in to our seats and peered out the window at the views. At first, we passed a number of small towns, all very charming with gardens, green hills, flowers, and greenhouses. And then halfway in to our trip, we came upon the ocean and that was lovely to look at as well. 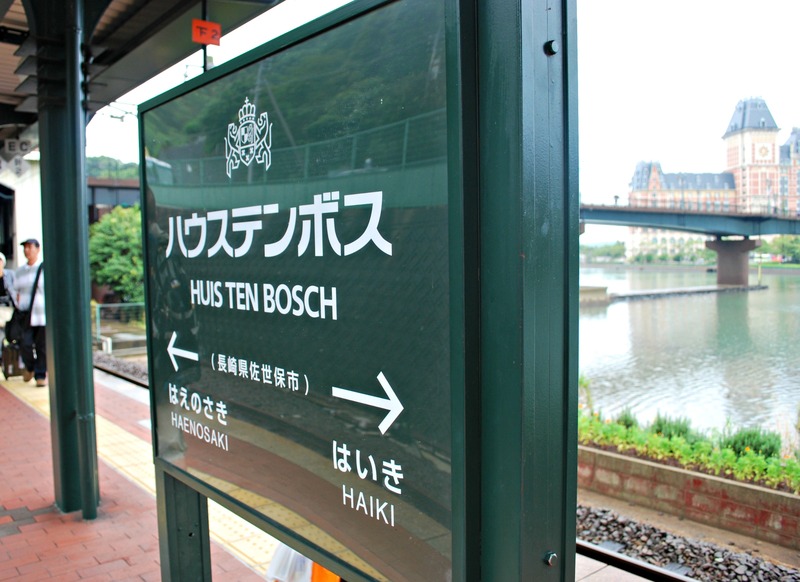 Roughly 75 minutes after we had boarded the Seaside Liner back in Nagasaki, the train pulled in to Huis Ten Bosch Station. Immediately after disembarking, we were able to catch our first view of the theme park from the station’s platform. And truly, it felt like we were no longer in Japan. 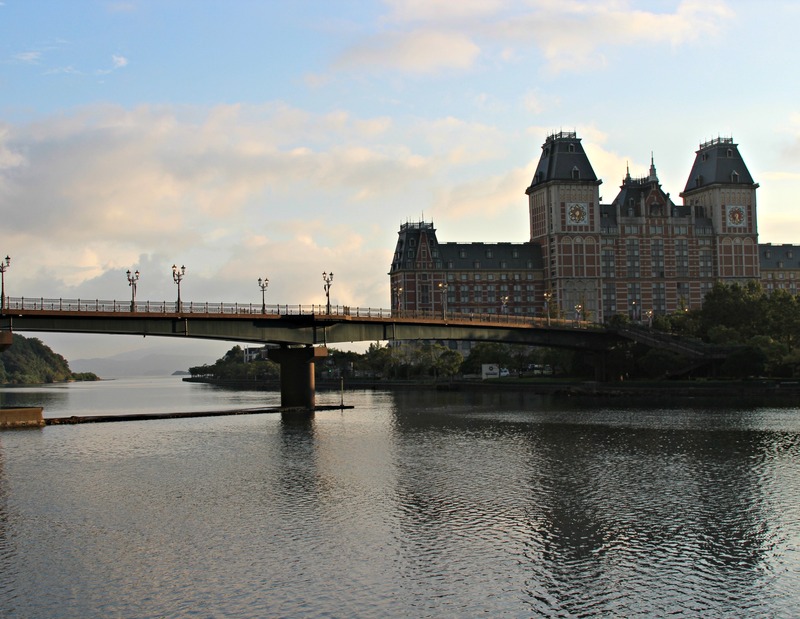 The bridge lined with streetlamps and the palatial hotel looked thoroughly European. Unfortunately, the rain was really starting to come down and there was a bit of a nasty wind accompanying it. So after zipping up our jackets to our chins and putting up our umbrellas we hurried over the bridge and made our way towards the front gate. Once there, we made a beeline for the ticket booth and bought our tickets. We chose to get the option that didn’t include any rides because I had read that they really weren’t worth the price. We were mostly just looking forward to taking a leisurely stroll through the park and immersing ourselves in the “Netherlands”. As we entered the theme park, I was delighted to see windmills directly to the left of us. The area was decorated with numerous flower beds and flanked by a sizable canal. I wanted to go there right away but M said that maybe it was better to stay on the path we were on and finish up with the windmills. Then we would really have something to look forward to. I decided that his suggestion sounded sensible enough so we set out towards the forest-y looking section which was directly ahead. 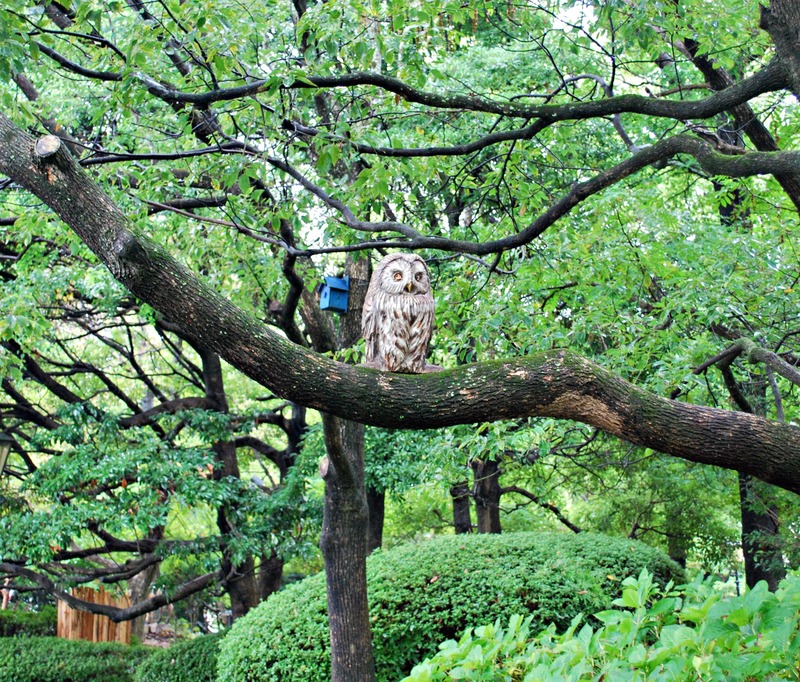 As we walked towards the trees, we were greeted by an owl figurine sitting on a branch. 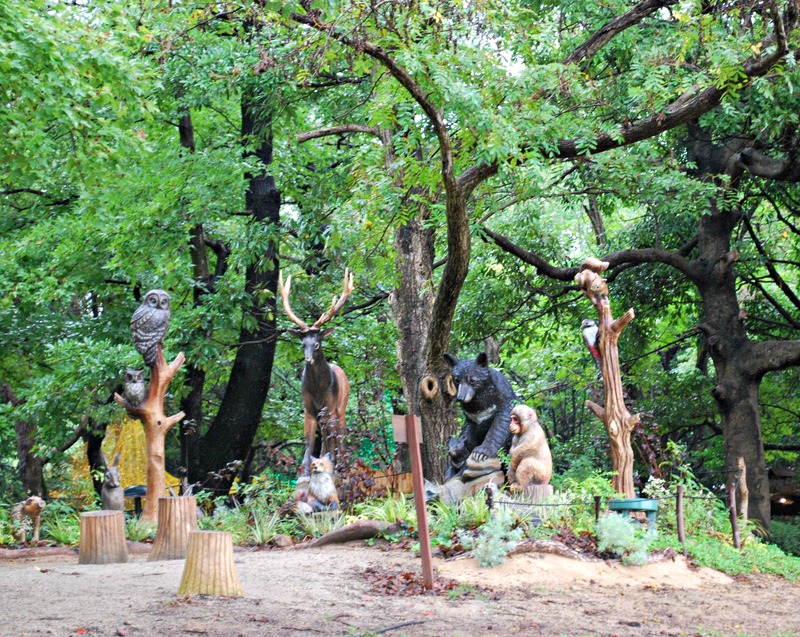 Then just around the corner was a group of animal figurines clustered together as if having a meeting. There was a monkey and a pig and a fox and a bear and a few other creatures. I just loved this! 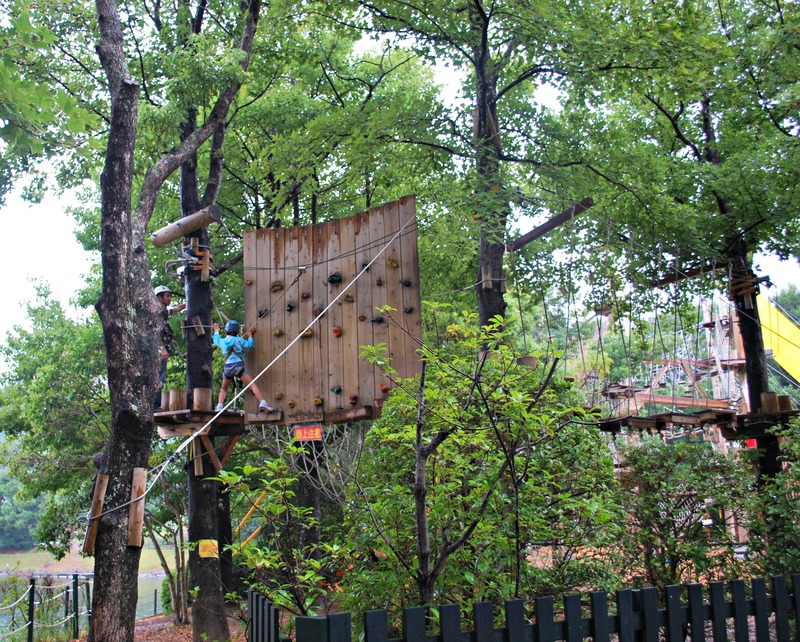 Also in the area was a forest-themed play area complete with rope bridges and a climbing wall. 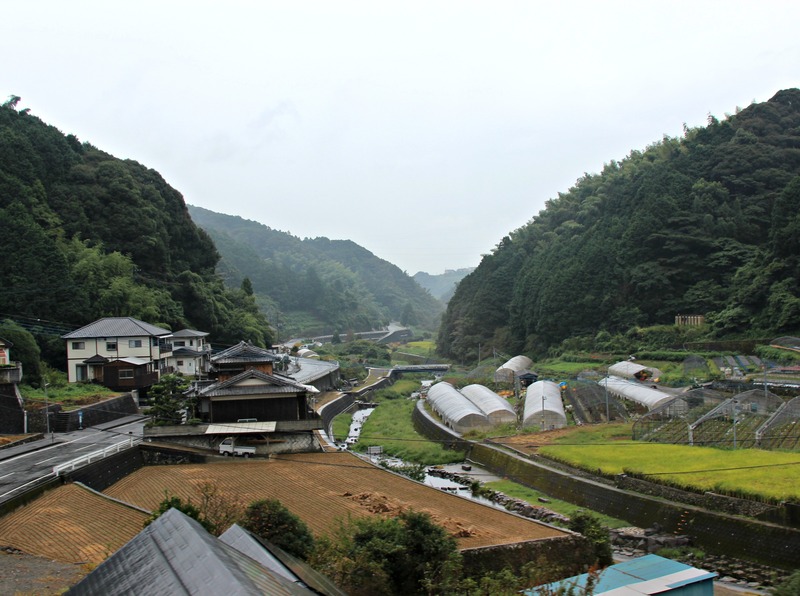 After leaving the forest behind us, we came upon rows and rows of stores and restaurants. 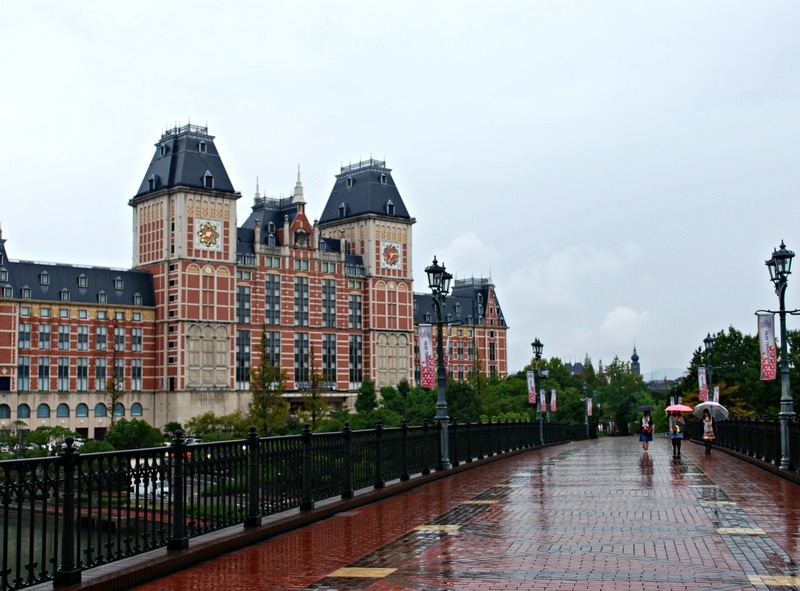 Walking through this area made us realize just how large Huis Ten Bosch really was. At this point, it started to feel less and less like a theme park and more and more like an actual city! Because we had already eaten a large lunch back in Nagasaki we chose not to eat at any of the restaurants. However, many of the stores had samples of chocolates and cheeses and sausages and castella and baumkuchen cake and we weren’t too full to partake in trying the majority of them. 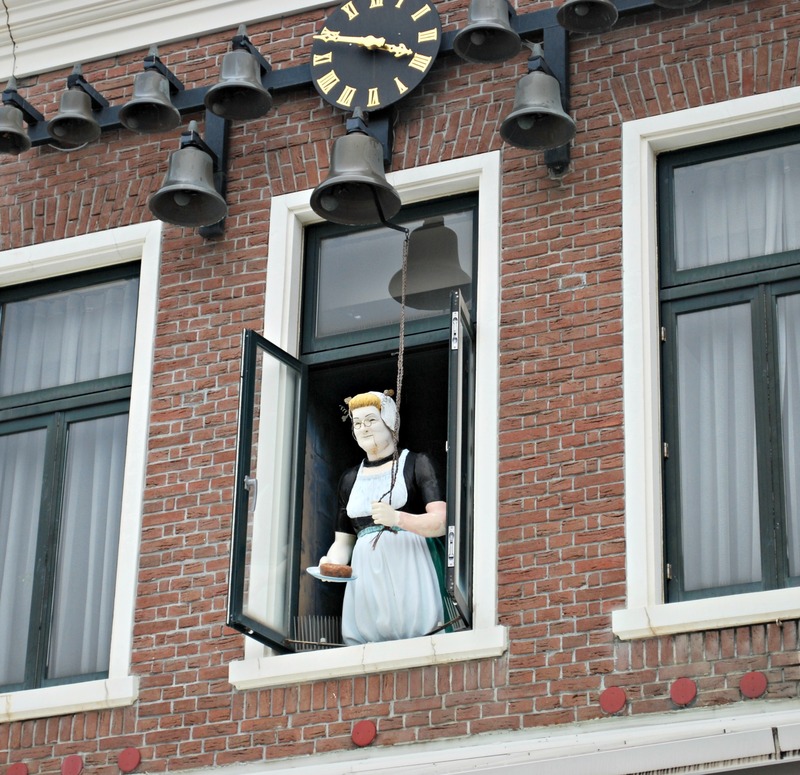 One store had the delightful idea of posing a grandmother mannequin in its upstairs window. She was leaning out with a plate of what looked like cake and it appeared that she was ringing a bell to invite customers in. From here, we headed to the area where the majority of rides and attractions seemed to be clustered. While we didn’t have access to any of these it was still fun to look around because they were decorated for Halloween. One thing that I found quite amusing was that many of the pumpkins had phrases on it like “Give thanks to the Lord”. I realized that these were most likely Thanksgiving decorations! 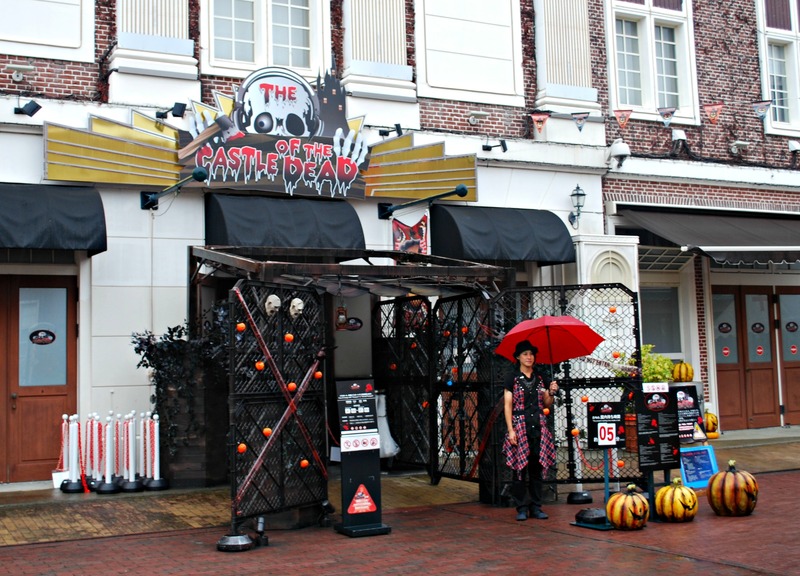 I’m not quite sure if the attractions had been switched to Halloween themed ones to mark the occasion, but they all had scary names like “Castle of the Dead” and “Ghost Wedding”, yikes! But the biggest yikes was right around the corner where there was a free peephole attraction. I must admit that I scare quite easily, but I was very curious to see what lay beyond the peephole. However, as I sidled up to it, a horrific moan came from behind the wall! My mouth dropped open and I quickly scuttled away without a look back. By now, we had walked quite a bit but M said we still had another canal to see as well as the Free Zone (an area that visitors can explore without having to pay any admission price). The canal turned out to be quite sizeable with a few boats floating along its surface. But the best boat in the whole park turned out to be in the Free Zone ironically enough. 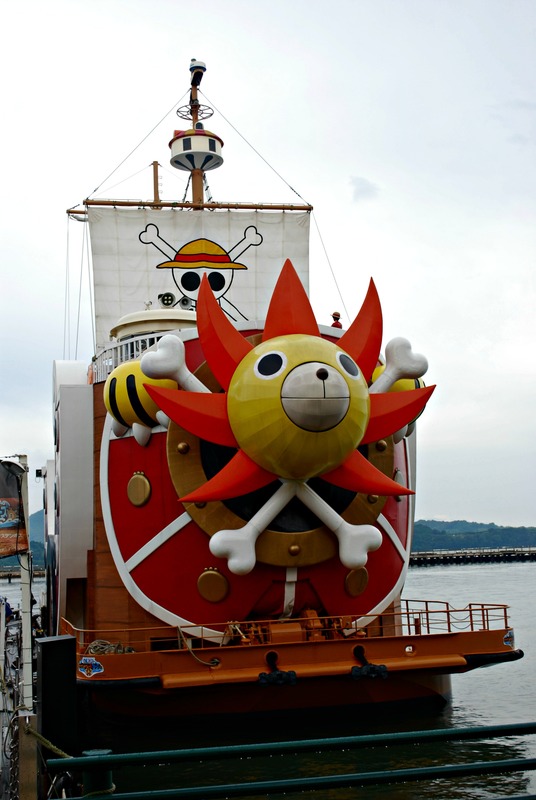 The One Piece Thousand Sunny ship was docked in the harbor! Although I’ve never watched the anime, I know how immensely popular it is and am somewhat familiar with the characters and storyline. The ship looked almost exactly like how it’s drawn on the show and manga and was really quite impressive. 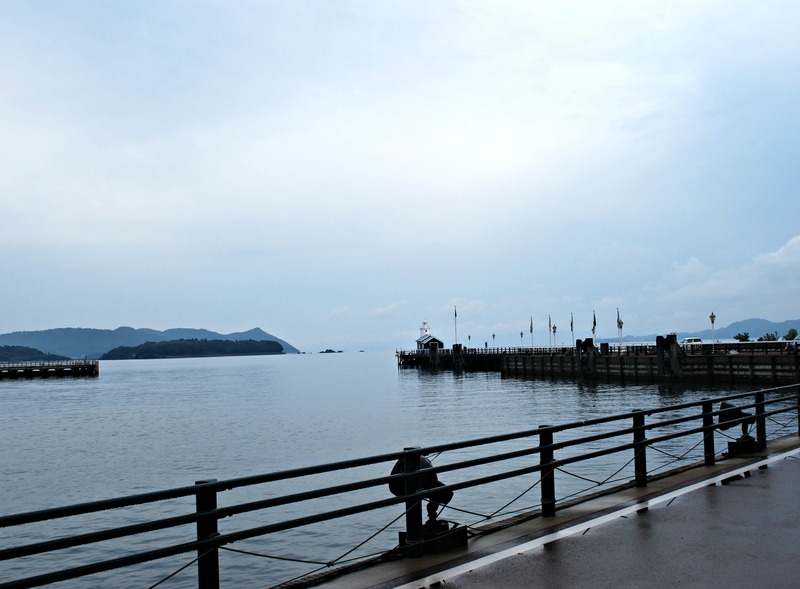 Beyond the ship, was the scenic marina area with a long dock. 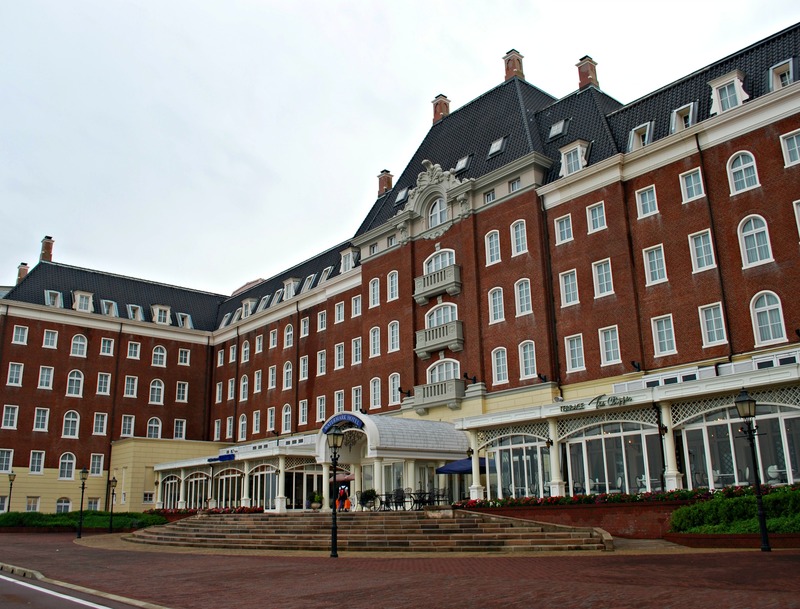 And behind us was an enormous hotel ~ the Watermark. Then it was time to head back to the windmills! As if on cue, the clouds slowly parted and the sun emerged at last. We were so glad to able to see the flowers and the windmills and the beautiful architecture in the light. The whole scene was so lovely that we stayed there for a good hour just soaking in the atmosphere and taking tons of pictures. But finally, we had to leave because it was our last night in Nagasaki and we wanted to make sure to have enough time after dinner to visit Mt. Inasa. 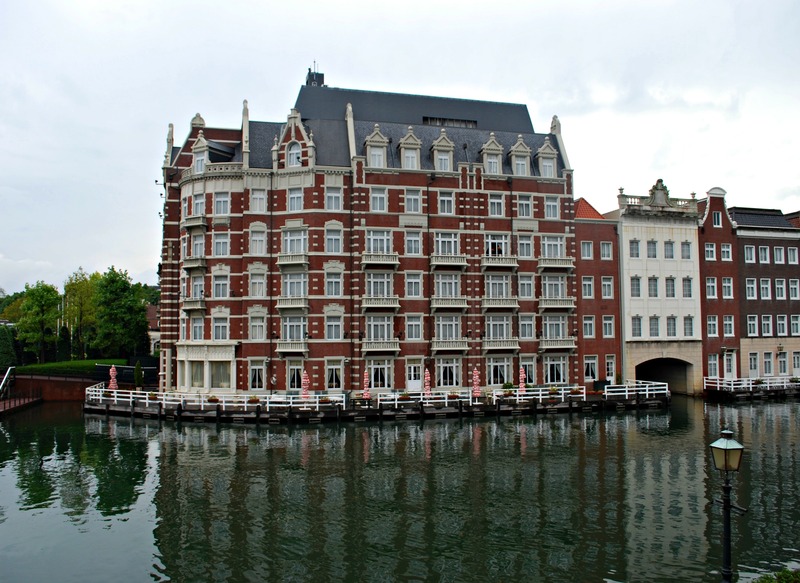 So with great reluctance we left Huis Ten Bosch to “return” back to Japan. It never ceases to amaze me how much the Japanese embrace foreign culture and they replicate it so well. This place is truly amazing – I have to make a point of visiting during one of our future trips to Japan. Your pictures are beautful! Arigatou! Thanks so much for your kind words! Huis Ten Bosch was truly impressive. 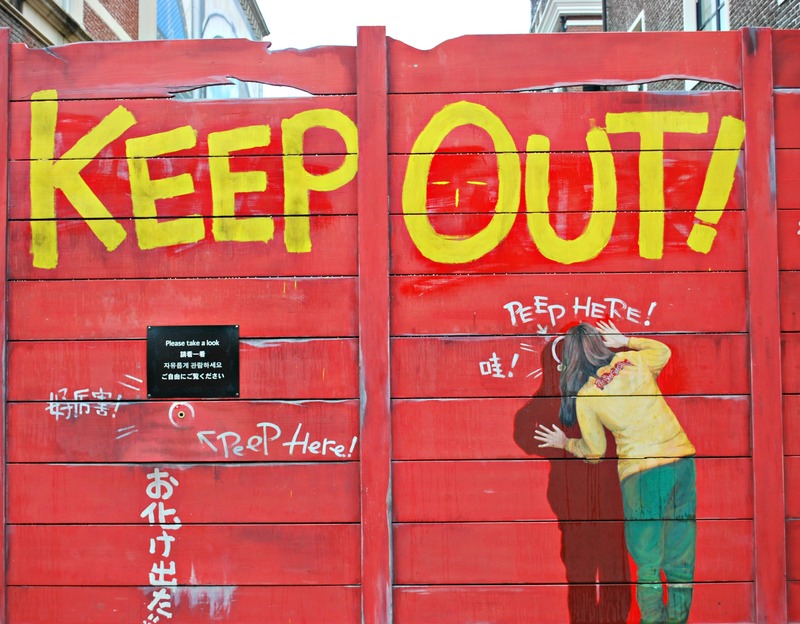 Because of its size, it was easy to forget we were still in Japan….it was like we’d been transported to the Netherlands. I read somewhere that it’s as large as Monaco, unbelievable. I hope you will enjoy it there when you go some day. I think spring is the best time to go because of all the flowers but it was still quite beautiful in the fall. It was truly a sight to behold. 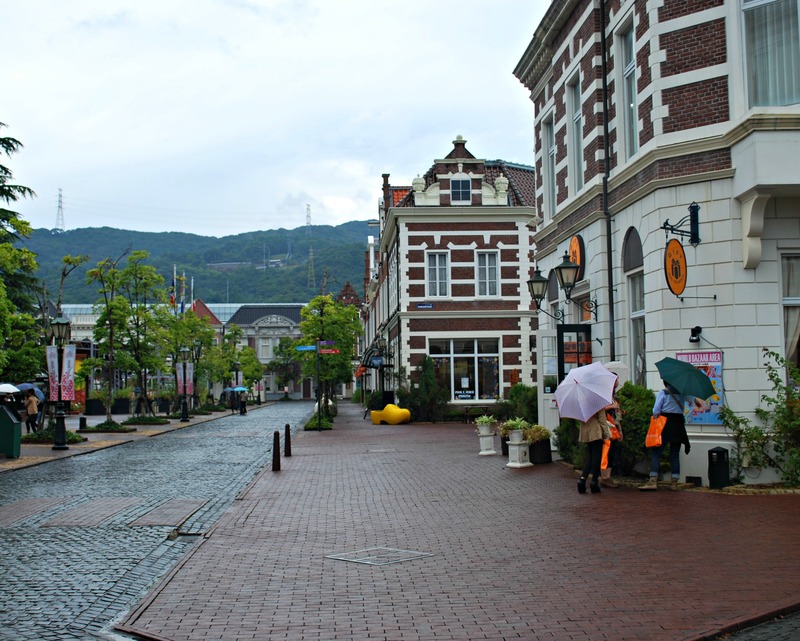 I can’t believe how well they were able to replicate a Dutch city, it was hard to believe I was still in Japan! Thanks so much! That’s a really good question about the buildings. There were so many of them that we didn’t get to go in to the majority of them. The ones we passed by were restaurants/shops/hotels. But it’s very possible that some were hollow and purely ornamental. Wow. Its a functional boat! That’s very nice. Maybe next time you can ride it? Hehehe. Lol, yes, hopefully I will get a chance to go on it someday. I think it would easier if they brought the boat back to Tokyo where it was originally docked. 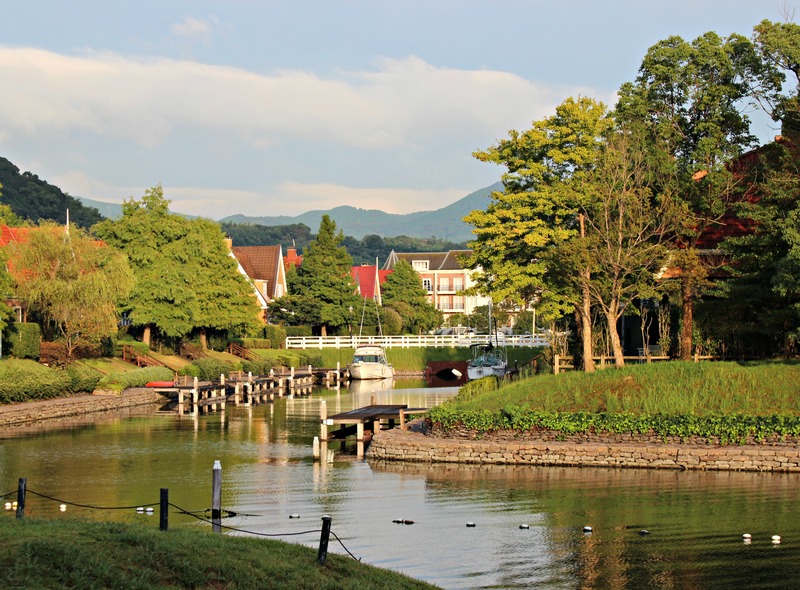 Unfortunately, Huis Ten Bosch is so out of the way, buried way down in Kyushu. But I would love some pictures with the characters! 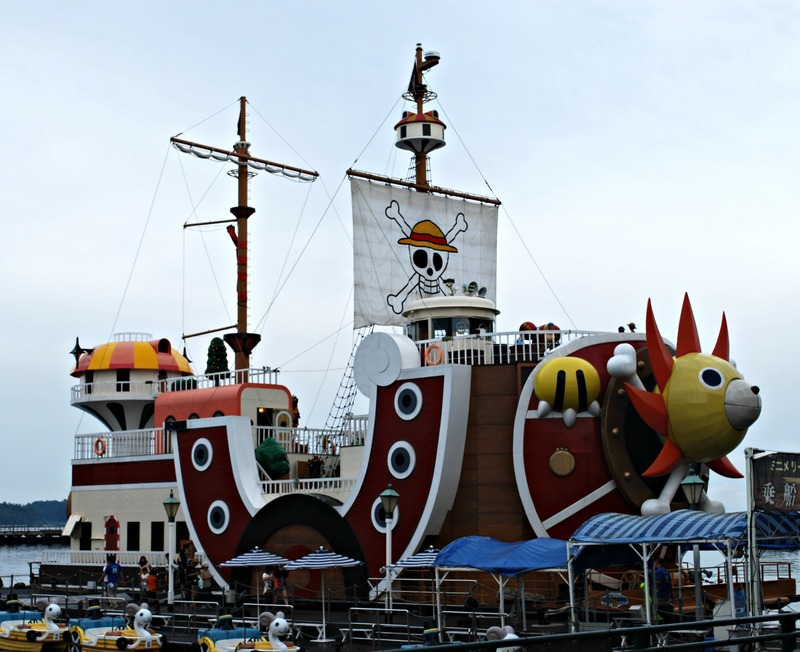 I’d pay 1000 yen in a heartbeat just to take pictures on Thousand Sunny ^^ The ship looks awesome! I know, I know, I’m really regretting not going on the ship now. Unfortunately, it was one of the last things we saw during our trip to the park and we were running out of time. Hopefully it will come back to Tokyo again where it was originally docked for a while. Wow what a truly amazing reporting of your visit to the theme park. I loved it. thank you. Thank you so much for your kind words! I’m so glad you enjoyed reading the post, it was a wonderful theme park and I had fun writing about it. Hope to get back there in the spring someday, I heard the flower beds there are incredible during that time. This place is beautiful! For some reason it reminded of Hayao Miyazaki’s work Castle in the Sky and Kiki’s Delivery Service. Your pictures are very pretty! Thank you very much! Yes, it was such a beautiful theme park and it was unbelievable how large it was. We were really struggling to cover all of it. I can totally see the connection to Kiki’s Delivery Service, I think some of the buildings look the same. And there was just a feeling of fantasy to the whole place, it was like we’d left Japan and been transported to a whole new land. Soo jealous! I’ve been dying to go ever since I learned about it from watching an episode of Conan. I spot the mini motor boat Merry’s…did you get a chance to go inside the Sunny or was it more of a look and take a picture kind of thing? Was the food good? Oh yeah, I meant to mention the mini boat Merry’s in my post and somehow forgot! I wish we’d had a chance to go inside the Sunny but, unfortunately, we were pressed for time. We didn’t actually eat anything while we were at the park because we’d had a huge champon/sara udon lunch back in Nagasaki. I don’t necessarily regret it because the park was actually very dead that day and most of the restaurants were empty and didn’t even look open. But there was one chocolate cafe there that I would love to try someday! So funny you found this picture! I’m pretty sure that’s the same ship I saw at Huis Ten Bosch. I think before it came to the theme park it was docked in Tokyo for a while. I really wish we’d had more time and jumped on to the boat. At the time I didn’t think it would be anything that special but now I’ve been seeing pictures/videos and the inside of the boat looks so awesome! 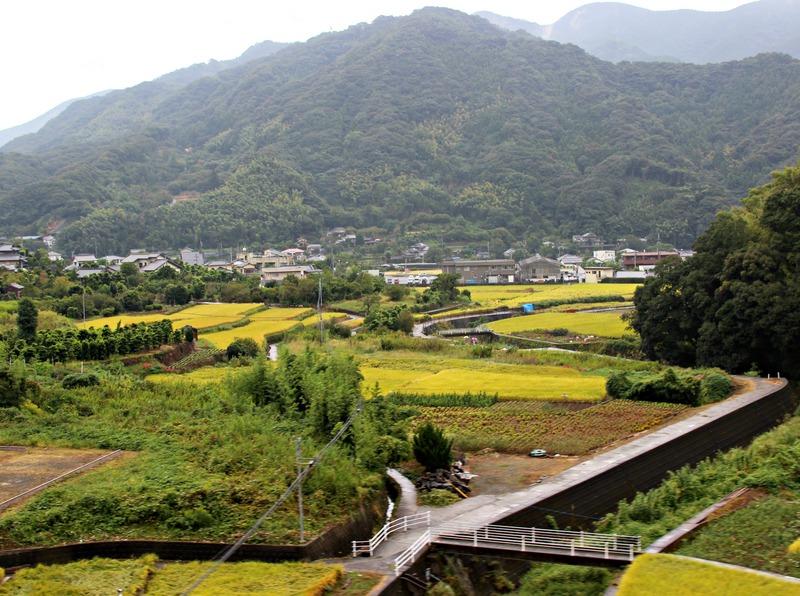 I never knew a place like this was hidden in Kyushu! Shall uncover more hidden jems the next time I head to Japan~ Definitely going to put this on my to-so list! I never would have known either, but it was listed in one of the guidebooks I read. Unfortunately, because of its location I don’t think it gets too many visitors which is a real shame. You can tell so much money went into building the park and there’s so much attention to detail. I hope you will enjoy when you go! That’s very nice 🙂 I just came back from the Netherlands, and I like the fact that this is appearing in Japan too. I’ll love to visit when I get the chance to go to Kyushu again. 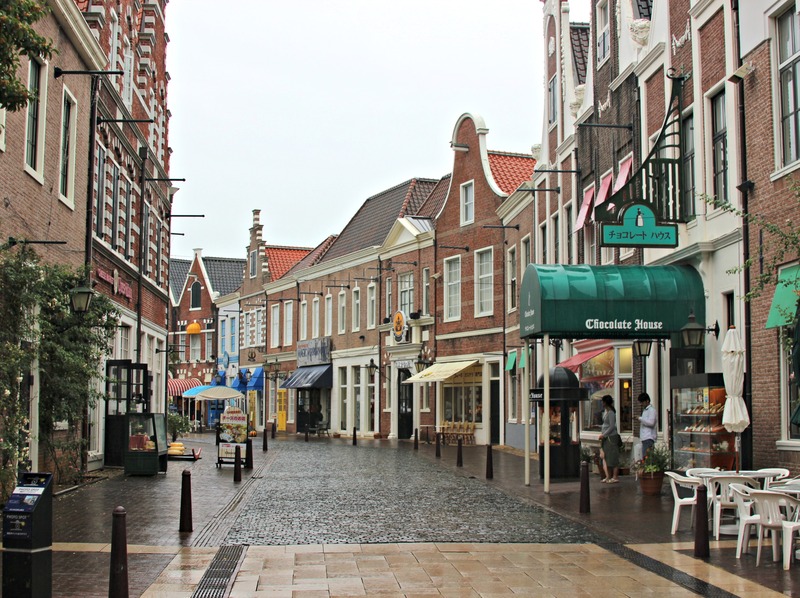 It was fun going to Huis Ten Bosch but the real Netherlands must be spectacular! I haven’t had the chance to go yet but this theme park really whetted my appetite. Yes, everyone says Amsterdam is a must but I’m actually looking more forward to seeing the countryside. It looks so gorgeous in pictures! Looking forward to your post on the Dutch lifestyle. And I know what you mean about being lazy post-Christmas. I think all the good food I’ve been eating has deadened my brain! That place is so incredibly beautiful! It feels like you can go anywhere to take pictures and have them come out looking like postcards. 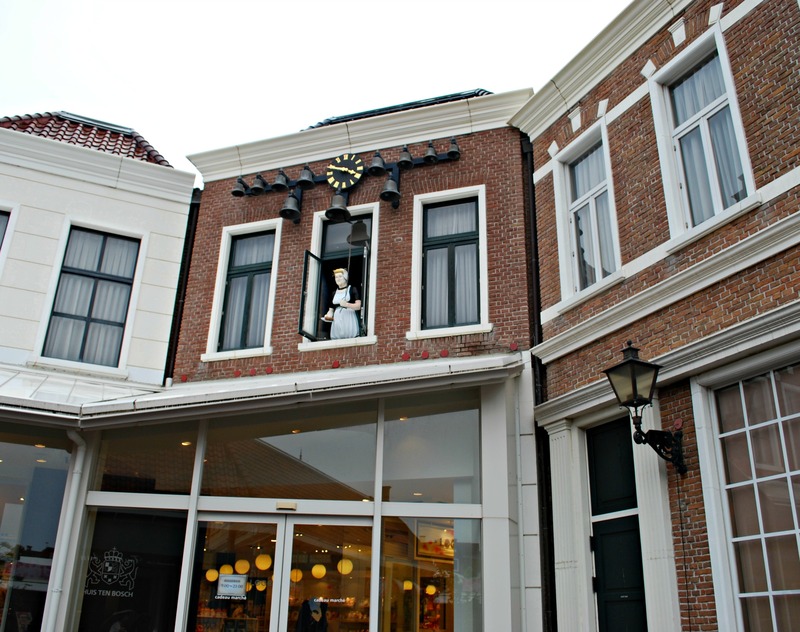 It’s amazing how much detail they put into reproducing the charm of the Netherlands. It’s definitely on one of my must-go places in Japan now! Oh yes, we took many many many pictures! And the park was so humongous so it took forever to get through it. Luckily it wasn’t crowded at all but it was a bit of a bummer that it was raining most of the time we were there. Still, I think that forced us in to a lot of the shops, many of which had food samples yay! Since that area is famous for castella, there were bunches of those and we probably ate a whole cakes worth lol. 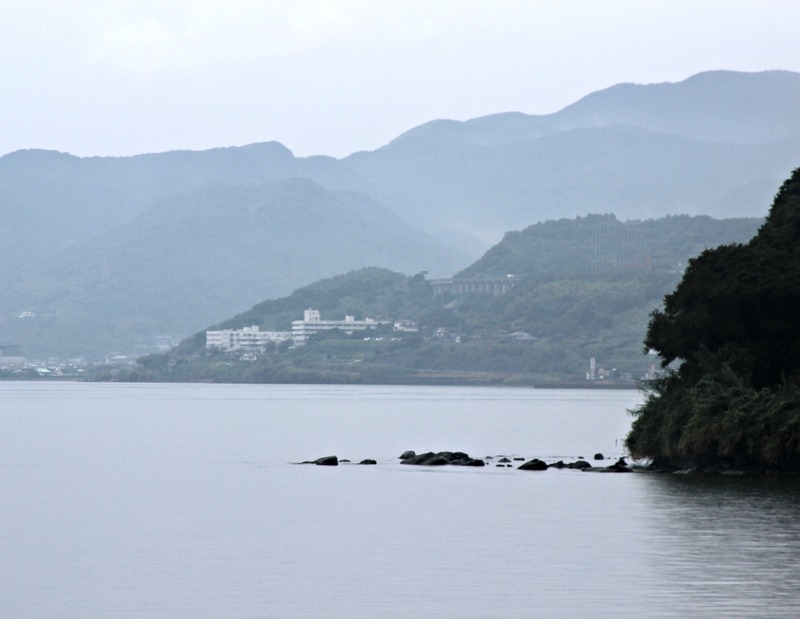 Have you been down to Kyushu yet? Besides Tokyo, it’s my favorite place to go to in Japan. The people on that island are so friendly and the food is fabulous. 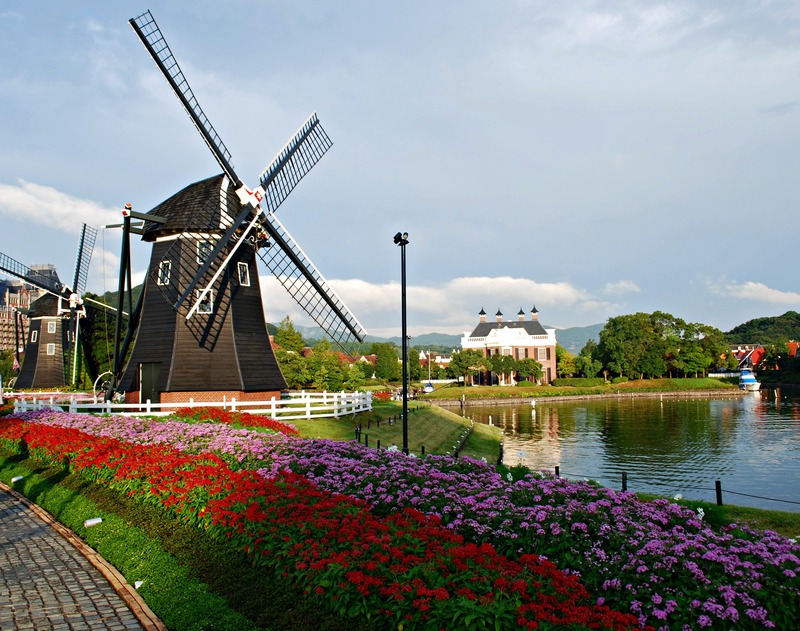 I hope you’ll get a chance to go to Huis Ten Bosch soon! Ohh wow I LOVE castella! And food samples of course, haha. If you love castella then you will find Nagasaki to be heaven! There is castella everywhere and even castella flavored drinks and castella ice cream sandwich and castella soft cream. The city is also the birthplace of champon and sara udon, so good! I think you would also like something called Toruko Rice — it’s rice topped with spaghetti topped with katsu topped with curry sauce and it’s a Nagasaki specialty. We only got to stay in Fukuoka for one night but we were able to eat at the yatai stalls along the canal, best beef tongue ever! This place is so nice! 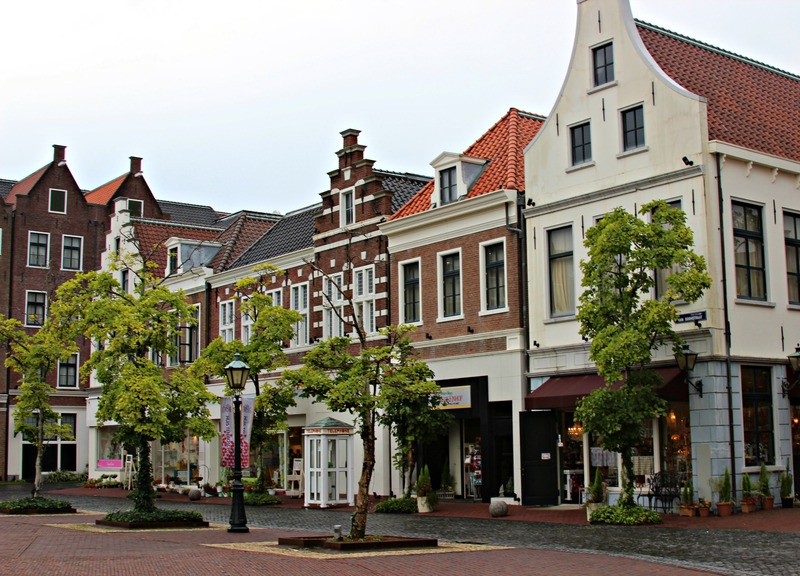 I’m not sure I would go, as I visited Netherlands years ago, but I am amazed at the Japanese capacity to faithfully reproduce Dutch-like buildings. Huis Ten Bosch was nice but I’m sure the real Netherlands must be beyond amazing. Haven’t been yet but I can’t wait to go someday. 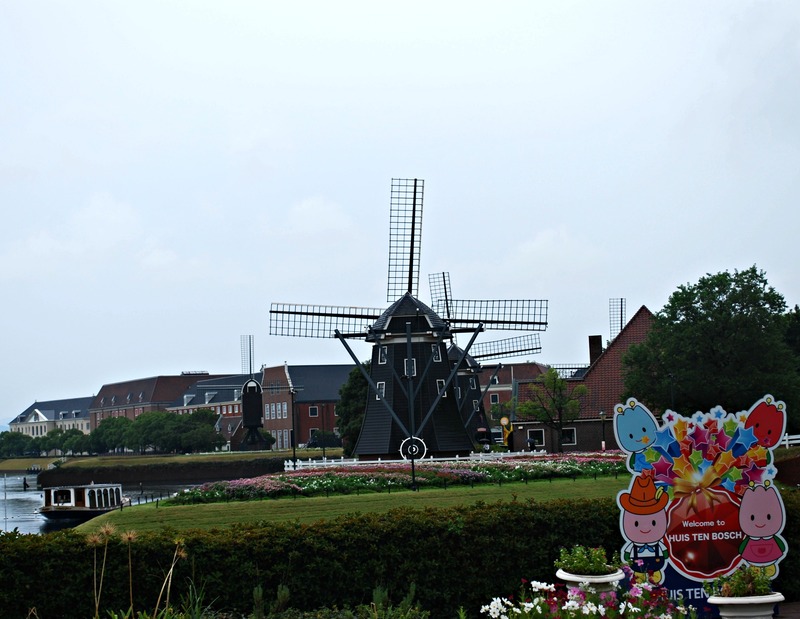 I’m glad I got to see Huis Ten Bosch though while it’s still in existence. 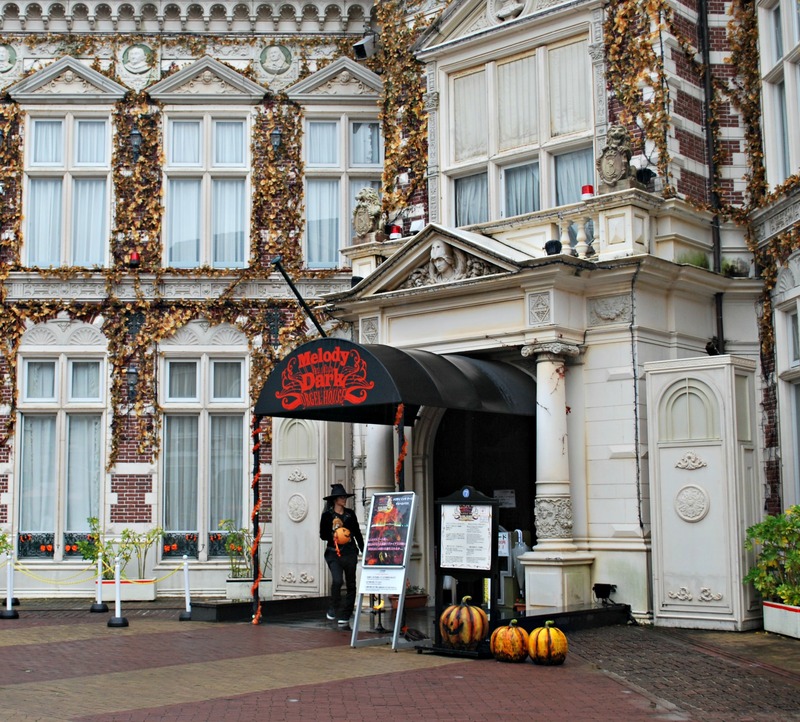 It was doing very well when it first opened but it’s been in the dumps financially as of late. Really sad when you think of all the money and time and attention to detail that went into it. That’s so incredible! And I love your photos. Rather than a theme park, it’s a theme city haha. The details are amazing. It’d be a great filming location too. I’d love to go there someday. Theme city, you’re so right about that! Maybe even theme country since it’s roughly the same size as Monaco lol. I hope you’ll get a chance to go there someday, it really is amazing. 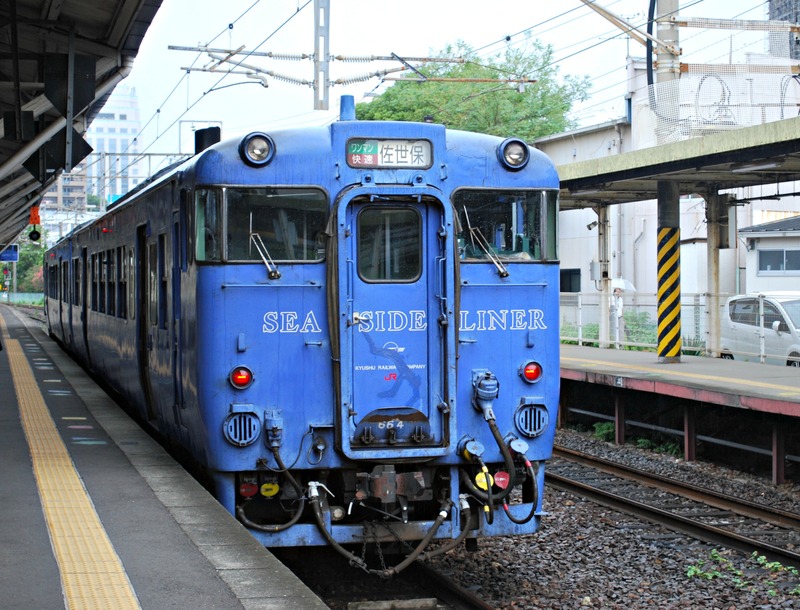 Going back to the earlier part of your post, one of the things I love most about travelling by train in Japan are the older branch lines that rumble through the countryside. The shinkansen is great fun (and comfortable) to ride on, as are the various limited express services – but one doesn’t get to enjoy much of what’s outside when the train’s zipping along at lightning-fast speeds (and even then, what one usually sees out the window are heavily built-up urban landscapes). I find that riding the less-developed branches of the JR network opens up a completely different side of the country: one made up of lush forests and misty mountains, rustic villages and verdant fields. Also, it’s great fun to find oneself on a slow train packed with locals (rather than tourists and businessmen) happily chatting away over packed lunches and cans of store-bought tea. The atmosphere is light years away from the staid, no-mobile-phone sterile silence of the superexpress rail services. 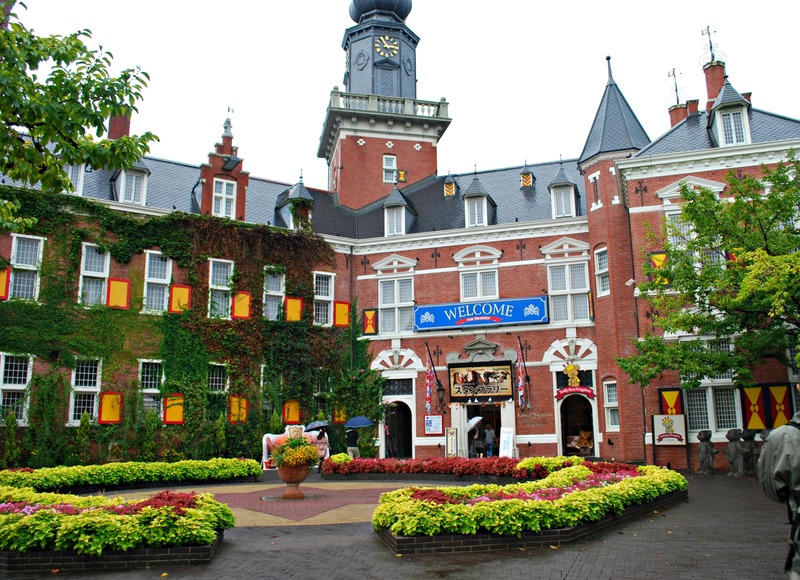 I have yet to see any other European recreation theme parks but it’s hard to imagine that there’s one as realistic as Huis Ten Bosch anywhere out there. It’s unbelievable how much time and money and attention to detail went into building the park. Unfortunately, it doesn’t seem to be doing very well, there were very few people the day that we went. I’m not sure if it’s because the location isn’t that great (buried in a little city in Kyushu) or people just aren’t interested. A real shame either way. 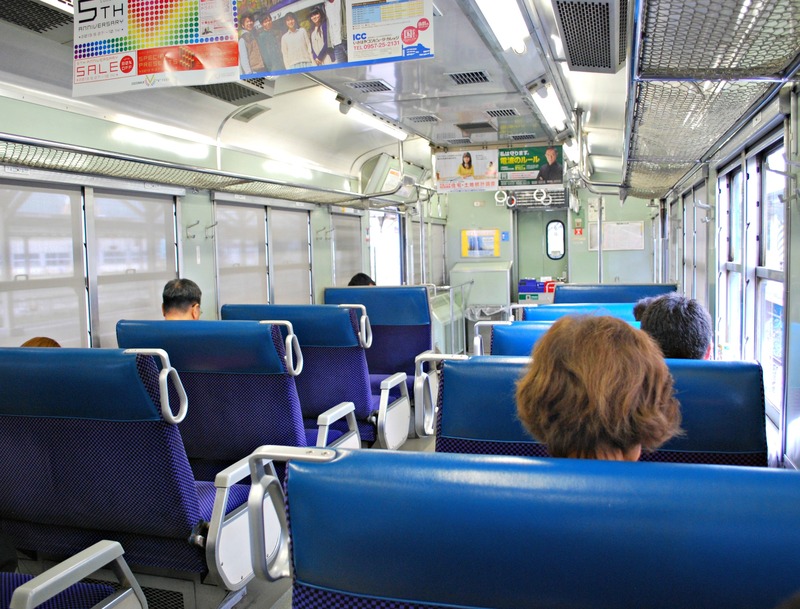 Yes, we love traveling on the smaller, more localized JR trains as well. And your description of the scenery one glimpses from the trains was perfect: “lush forests and misty mountains, rustic villages and verdant fields”. I always wish we could jump off randomly at one of the train stops and just explore one of the inakas for an afternoon. But we’re always in such a hurry to get to our destination so we never really get the chance. Must do that on one of our future visits! And yes, it’s great to be mingling with the locals on these kinds of trains. Funny how you brought up the packed lunches because I always try and peer around to see what everyone’s eating! M and I will usually pick up ekibens but lots of people have meals they packed from home. There’s nothing like a homemade bento! This place looks amazing. Never in a million years would I guess this is in Japan. Your photos are stunning. My fave is the last photo. Thank you very much! 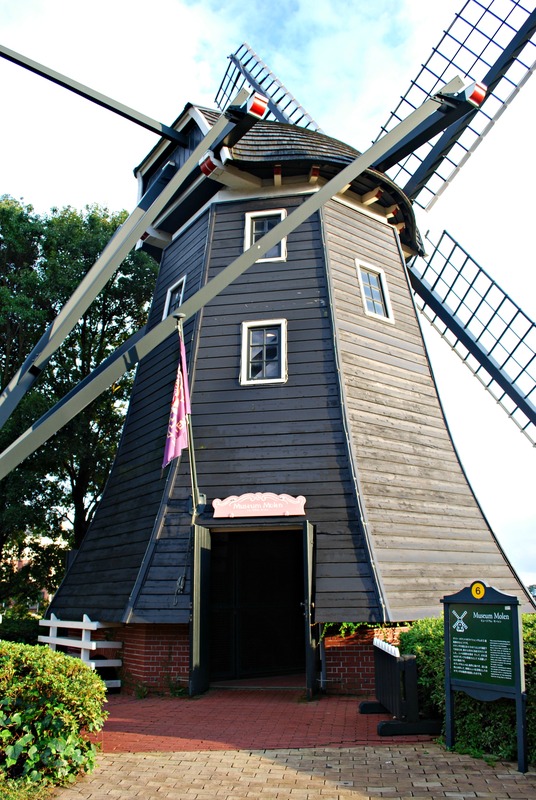 Yes, the last picture was my favorite as well, I just loved the area where the windmills were. So glad that the sun came out when we came to that area. That’s so cute! I had no idea there was a Netherlands in Japan! 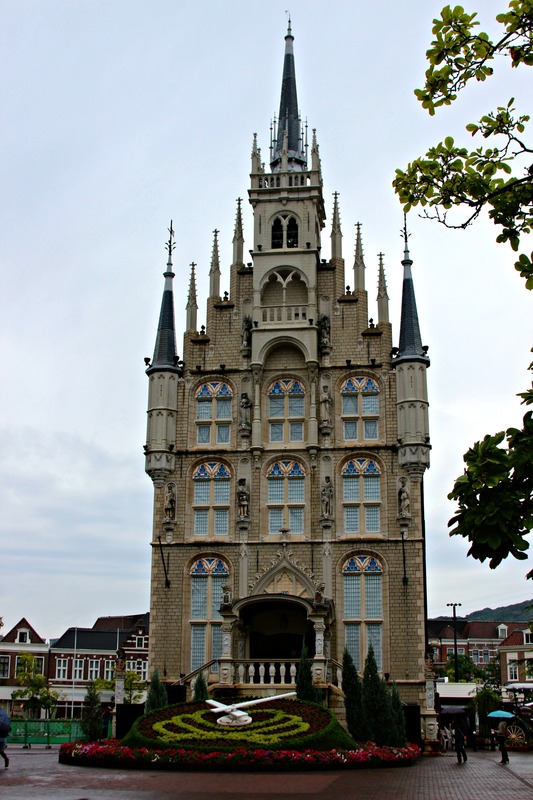 Oh I know, I’d never heard of Huis Ten Bosch until I saw it in a Japan guidebook. Decided I had to go after seeing other blog posts on it. The pictures looked so beautiful! 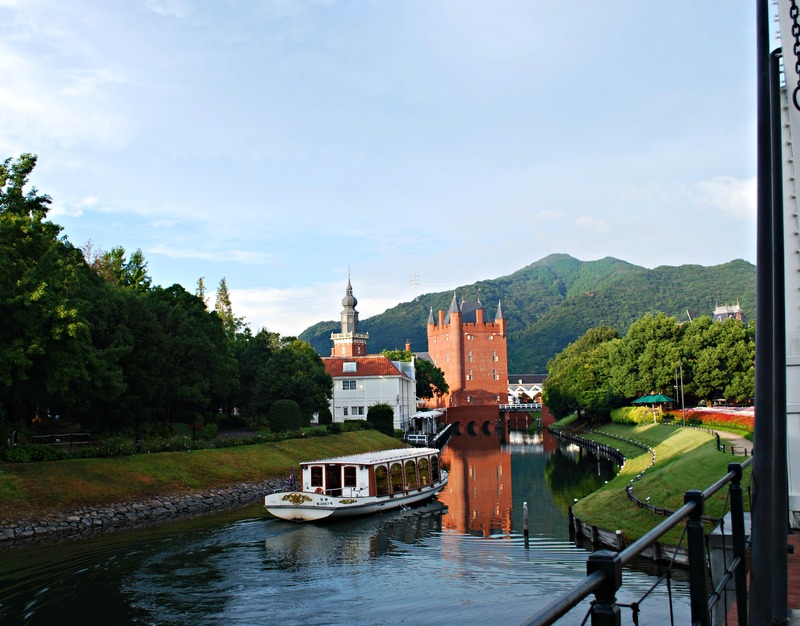 Thank you, it was easy to take good pictures at Huis Ten Bosch because it was so beautiful every where I looked. When was your visit there? Really interesting post– who would have known? The park seems like a big investment but there were hardly any people in your photos– was that because of the rain? 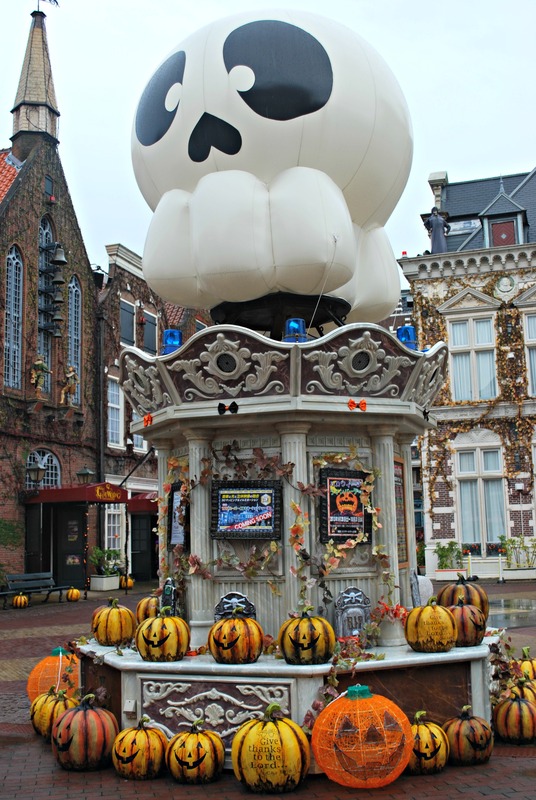 Unfortunately, I don’t think Huis Ten Bosch is doing very well even on sunny days. From what I’ve heard it’s always on the brink of bankruptcy due to very low attendance. I’m glad I had the chance to go since it looks like there’s a chance it will get shut down in the future. 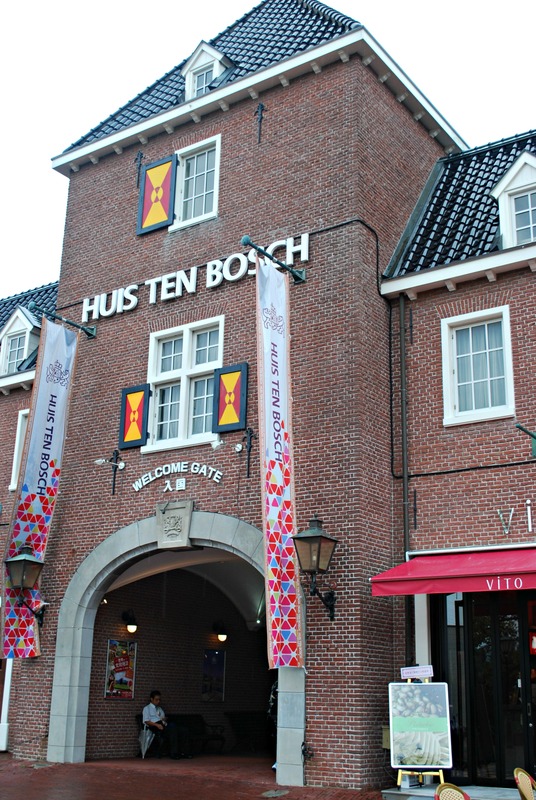 Yeah, I don’t think that many people are all that keen on going to Huis Ten Bosch. It was sadly quite deserted on the day that we went. I think the location is pretty bad, kinda out there in the boondocks. 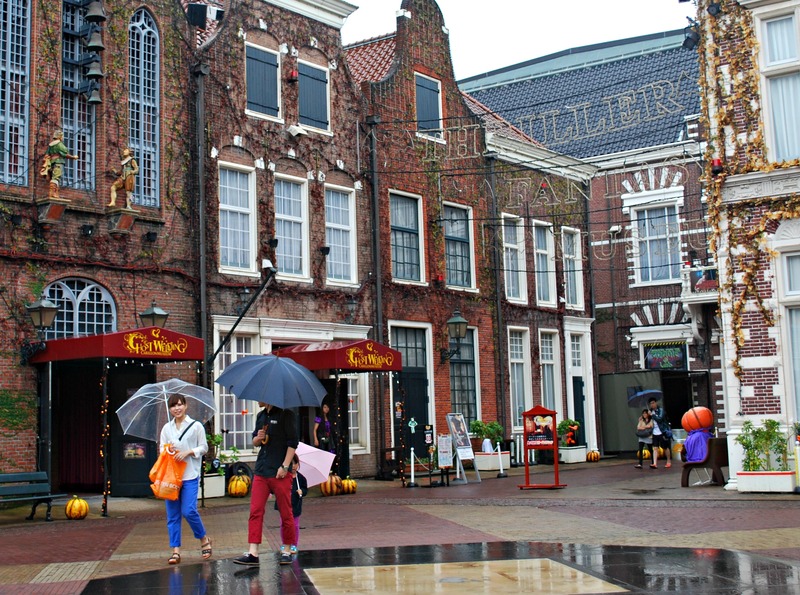 It’s amazing how they have recreated the Netherlands so faithfully right there in Japan. Incredibly realistic. I can see the $2 billion was spent well! Hi Vijay, as always, thanks for your comment. 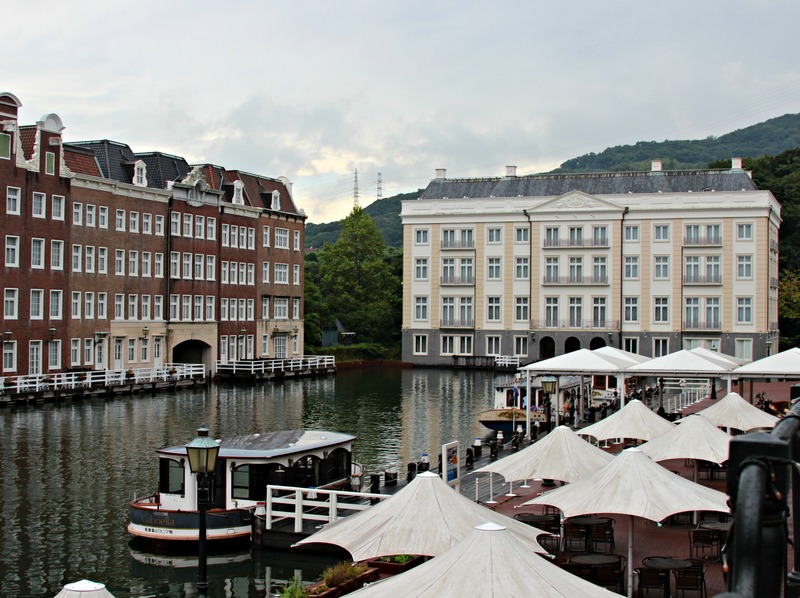 Huis Ten Bosch was quite beautiful, you could see that no expense was spared in making the visitor feel as if they were truly in the Netherlands. I’d love to go back again in the spring when all the flowers are in bloom. Lol, you’re so right, the tour should be teaching them Dutch, not English. Maybe the park thinks they won’t get as many people signing up though. The hotels there were all very large and fancy looking so I would think it would be a very nice getaway for seniors. Oh yes, we had both champon and sara udon at the famous Shikairo restaurant. Their claim to fame is that they supposedly invented those 2 dishes. Not sure if it’s really true but their food was very, very good. And the restaurant had wonderful views of the harbour as well. An impressive blog entry! I’ve also been there once, during which there were fireworks display contests. I missed the fireworks nevertheless the place deeply impressed me. 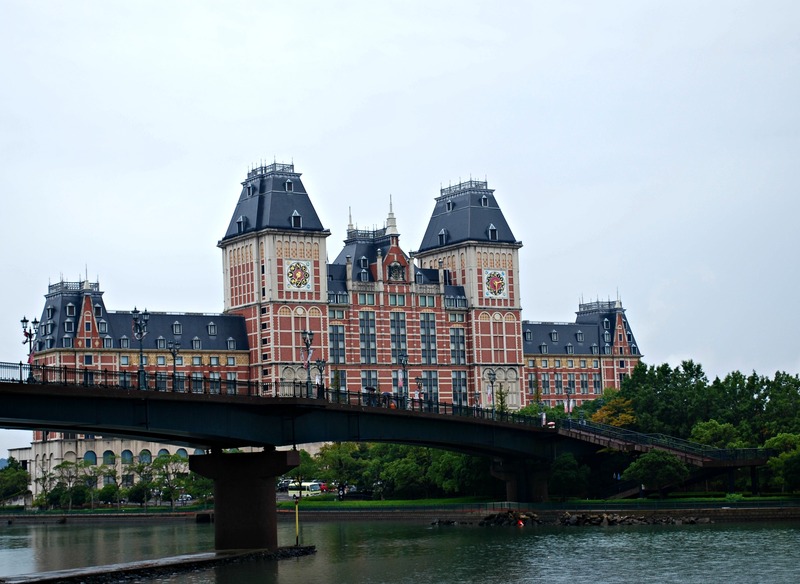 The day time of huis ten Bosch is very beautiful; the boat ride at night merely impressed me further. One another thing is the 100% replica of the ship from manga, “One Piece”. Thank you very much for your kind words! We were only at Huis Ten Bosch during the day so I’m not sure if they did fireworks at night. But if they did, too bad we missed it! 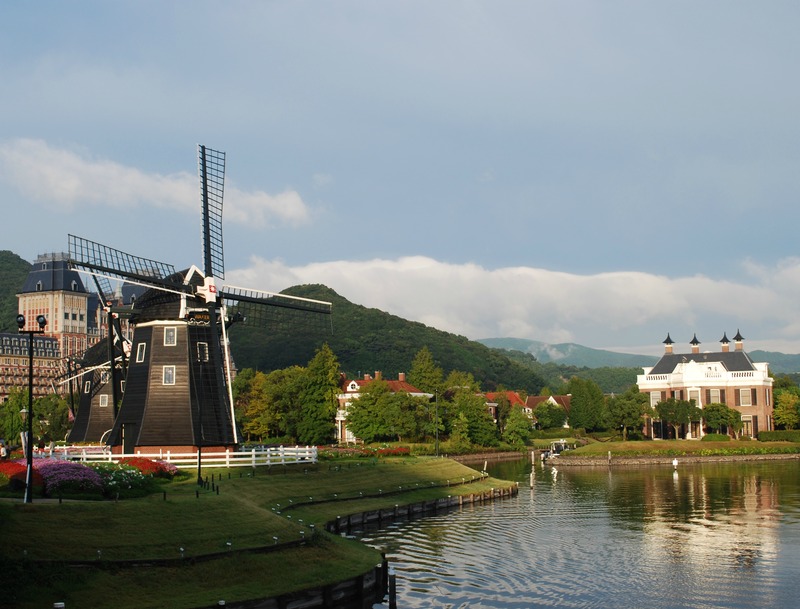 Yes, it was a very beautiful park, I especially loved the area with the windmills, it was hard to believe I was still in Japan….I felt like I had been magically transported to the Netherlands. I would love to go back in the spring time when all the flowers are in bloom, I’m sure that would be a spectacular sight. 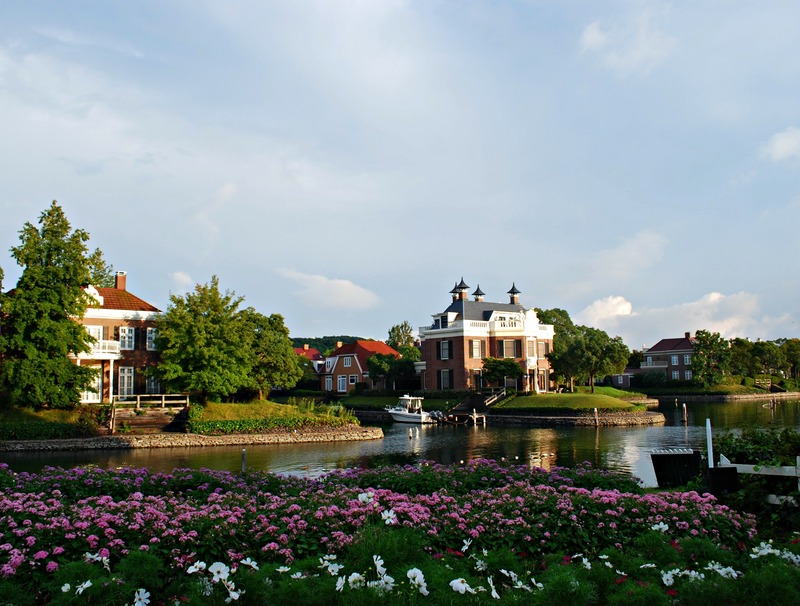 Huis Ten Bosch is worth to visit again. You could check their website before visiting so that you would know what kind of special events are undergoing. The firework display was a special event where firework artists gathered together for a competition. I saw there was an event for flower exhibition as well, but it was still too early when I was there. I agree with you, that it’s magical experience. 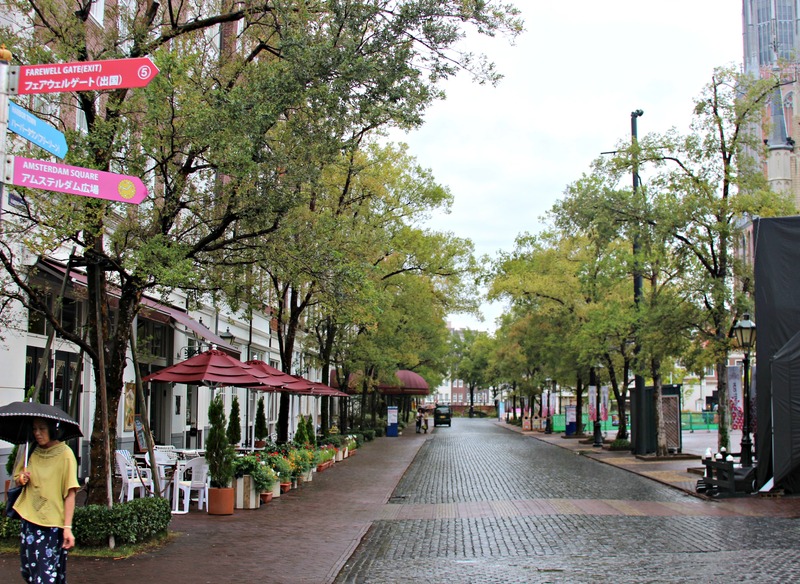 I felt myself traveling in a European town on that day. It’s quite amazing. Thanks for the tip. I would love go during the flower exhibition. I’ve seen pictures of the park when all the flowers are in bloom and it’s so beautiful. I definitely want to go back when I’m in the Nagasaki area again. I visited here when I was really little and I thought this place closed down few years back. Glad to know it is still open, it is beautiful! Thank you so much for commenting! I’m not surprised you thought the park had shut down. It was very, very empty on the day that we went and I fear that it will not be open for much longer if they keep getting such low attendance. Such a shame when you think of all the money and effort that went into building the park.